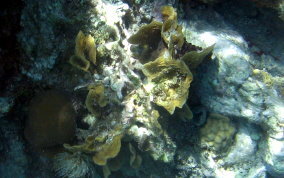 I've only spotted small patches of what appears to be Thin leaf Lettuce Coral. 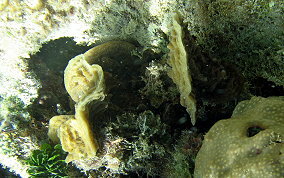 It differs from Scaled Lettuce coral in that the blades are much finer and delicate with polyps on both sides. Thin Leaf also seems to have "leaves" that grow both horizontally and vertically. Observed at depths of around 8-10 feet. Please Consider Supporting this Site. Help keep this site advertisement free by making a donation through PayPal If you have found this site useful, please consider lending your support to it's continuation. As an incentive, ten percent of all donations will go to the No Lionfish STJ organization to purchase spears, markers and other organizational needs. I would appreciate your support.